Apply for a Smart Money MasterCard. Click here and follow steps A to E.
Unlock for Offline Purchase. Offline purchasing is unlocked by default. When your card is unlocked, you can use your Smart Money MasterCard for shopping at any store that accepts MasterCard. To check its status, go to Smart Money > Card Mgmt > Txn Lock > Check Status. Unlock for Online Purchase. Online purchasing is locked by default. It needs to be unlocked before purchasing online. To unlock, go to Smart Money > Internet Txns > Unlock. It automatically locks after 5 minutes. Use your Smart Money offline. Use your card to buy in a grocery store. When your parents/friends go grocery shopping, offer to pay their bill using your Smart Money MasterCard and in return, let them pay you in cash. Use your Smart Money online. Donate $1 to Wikipedia. Choose Pay by Credit Card. Dont forget to unlock it. Login to Paypal and add your Smart Money MasterCard. Under Profile, choose Add/Edit Credit Card. Confirm your Smart Money MasterCard. 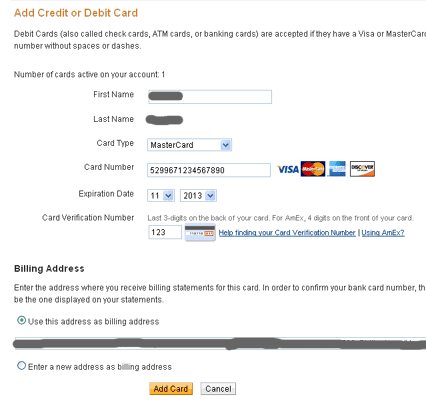 Click Confirm My Card as shown below. Enter the code. 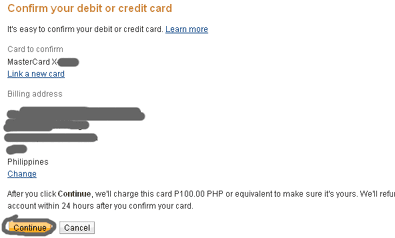 If successful, the Php 100 charge will be refunded back to your Paypal account in dollars. Test it. Unlock your Smart Money MasterCard and donate $1 again to Wikipedia. But this time, choose Pay via Paypal. If your Paypal balance is zero, the $1 donation will be charged directly to your Smart Money MasterCard. hi sir. how to transfer smart money to paypal. do u need a card? like smart money card?? can the smart money card be used for receiving PayPal payments? How to link my smart money to PayPal? I mean can I use my smart money to receive PayPal ? This is frustrating and irritating, i even tried other online shop that has direct CC transaction without using paypal, same problem. I can’t use it. You said that unlocking takes 5 minutes before automatically locked, but after unlocking my card it locks after a seconds. BLA BLA!!! hi, anyone knows how much transaction charge ng smart money pag nagwithdraw ng paypal balance papuntang smart money card/bdo bank account? how can i unlock my account / smart money to purchase online ? help me please ? im done withdrawing money from my paypal account to my smart money card. how long does bdo process? paypal done completing transferring to bdo. do i receive notification text that my money is ready to withdraw on my card?. how long will it take to get into my card? Sinubukan ko pong iverify paypal ko using smart money, pero ganito po ang laging lumalabas:The bank that issued your card didn’t approve this transaction. Please contact the card issuer’s customer service department if you have any questions. Or you can add a different card now to continue.Naka unlock naman po ung internet transaction nung ginawa, may load din po ung sim ko at may balance akong 500 sa smart money ko.Patulong po. Salamat. 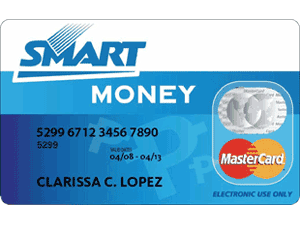 Try using your Smart Money Card first like withdrawing or checking your balance in an ATM or using it to buy an inexpensive item in a grocery. Perhaps it needs to have a credit history or something before it gets recognized by PayPal. any one tried linking smart money to skrill? To Gio Roselafter successfully linkingsmartmoney to paypal… have you tried doing withdrawal from paypal to your smartmoney account? How much is the fee for the withdrawal? I’m new to these kinds of money transfer transactions. I already got a paypal account & smartmoney account. Thank you. wow caroline it works!i’ve successfully linked my smartmoney to paypal,thank u so much. keep posting great articles. I am a greenwall installer in the Philippines that want to link my smart money card with paypal to pay my landscape architect consultant. You can check out my site verticalgardenphilippines.weebly.com for more details. One thing I think that is missing from online guides is the fact that you need to have a regular load balance ( P30,up )or you will always receive an “insufficient load balance” error. who is Clarriza C Lopez? why she is always seen when im searching my accounts? I want to unlock my Smartmoney card I go to Smartmoney>Card Mgmt>Card Lock>Unlock>MySmartMoney1>AcceptThen Error: E3 XXhow am i supposed to unlock it? To those who can’t link, like I once did, make sure you unlock your card for online purposes. How? Look for INTERNET TXNS on your Smart money menu. If it is not there, like mine, you have to update your menu by texting INTERNET to 343. Then your menu will update and will show Internet Txns, and from there you can unlock it for internet purchases. That’s my troubleshoot. This really works. I didn’t have to purchase anything just to make it work. All I did was to make sure that I have sufficient funds in my SMART Money account and that I’ve unlocked my SMART Money Card first before continuing with adding my card. It took me several tries but finally I got it to work. Withdrawing funds from paypal to smart money is very lousy and makes me lose my temper while waiting for a long timeWhat should i do? its been 1 week now since i withdrew money fom paypal to smartmoney but still i have not received any confirmation from my smartmoney that the money is already there..So stuck up such a waste of time, im losing my temper..
Just got verified a while ago. For those who are not able to verify, pls. check if your card is already activated, it should be activated before you can use it to verify your paypal. And Unlock it for internet/online transactions first before submitting your card. does it need to have the same name and billing address ??? My smartmoney card is under my brother’s name but im the one using it both atm card and sim card. Mine too! I cannot link my smartmoney card to Paypal. I just loaded P200 to my Smart Money account. Do I really need to use it first for my account to get verified? Because I tried several times already to verify my Paypal using Smart Money but it still was unsuccessful. I even called the Smart Money twice and I did as I was told, but it was still unsuccessful. hi!how do i unlock my smartmoney card if i want to add it to my paypal account? i found something from the net how to unlock and it says I have to go to the menu of my fone which is INTERNET TXN then choose unlock, unfortunately i dont have it. only TXN SUMMARY.pls advise,thanks.